At least not your operating guidance. "Fool me once, shame on...shame on you. Fool me...you can't get fooled again." That's it, Amazon.com (Nasdaq: AMZN)! I've had enough! You won't fool this Fool again. Don't get me wrong, though, old friend. I'm thoroughly pleased with the first-quarter earnings you just posted. What's got me going is the e-tailer's guidance of late -- the same guidance that has been the culprit behind both of the sell-offs over the past two earnings releases. For the past two quarters, investors dumped their shares (13% and 8% losses, respectively) when Amazon warned it could see some operating losses in the coming quarter. For the past two quarters, the company ended up posting operating income above the high end of its forecast, showing that all that consternation was for naught. Actual $260 million $192 million ??? Furthermore, Amazon is doing it again! Next quarter's guidance calls for operating income to be between a $260 million loss and a $40 million gain. Well, I don't buy it. Not that I was ever particularly concerned in the first place, since Amazon is simply investing in infrastructure for future growth (have you seen Amazon's amazing automatons?). I don't blame Amazon for being overly cautious with its forecasts, but I do blame all the myopic investors who unloaded shares, letting the sheer possibility of an operating loss negate two otherwise solid earnings reports. Rounding out second-quarter guidance, revenue should be in the range of $11.9 billion-$13.3 billion, which would represent growth of 20% and 34%, respectively. Just because I don't believe Amazon's operating guidance much anymore doesn't mean I've lost faith in the company. Quite the contrary -- my shares are firmly grounded in my portfolio. First-quarter sales soared 34% to $13.2 billion. Operating income fell 40% to $192 million, but we've already talked about that. Net income fell 35% to $130 million, or $0.28 per share. Those top- and bottom-line figures easily flew by the Street's best guesses, which were for $12.9 billion in revenue and a measly $0.07-per-share profit. Trailing-12-month free cash flow dropped 39% to $1.15 billion, as Amazon continues to put money back into the business. The mix of international and North American sales remained relatively unchanged, with international sales jumping 31% as North American revenue grew 36%. Naturally, Amazon stuck with ambiguous comments on the Kindle Fire, simply saying it remained the "No. 1 best-selling" product. CFO Thomas Szkutak said Kindle Fire customers are loading up their devices with content, which has helped North American media sales reaccelerate. Media sales jumped 19% to $4.7 billion, which is largely thanks to that growing installed base of Kindles and Kindle Fires. Selling the Kindle Fires near cost is already starting to pay off as a portal directly into the digital wallets of consumers whose credit card numbers are already stored on Amazon servers. comScore released some figures yesterday, too, with the researcher showing "rapid adoption" of the Kindle Fire. 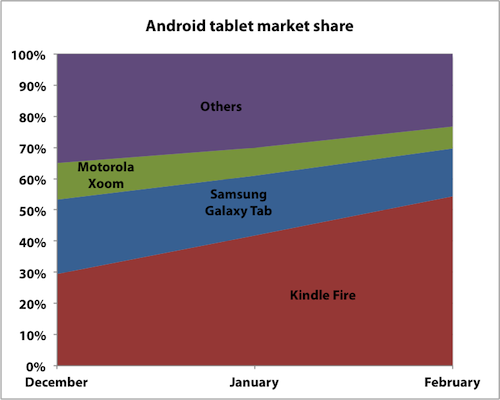 Amazon's tablet now claims a whopping 54.4% of the Google (Nasdaq: GOOG) Android tablet market after just six months. 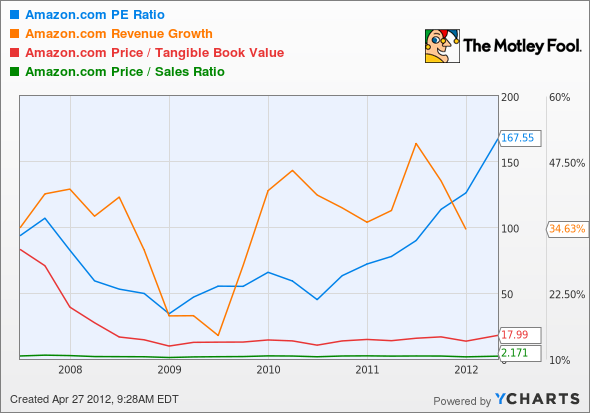 Samsung's Galaxy Tab family fell to 15.4%, while Motorola Mobility's (NYSE: MMI) Xoom sits at 7%. You'd think that Google would take this as good news, but Amazon is effectively hijacking the whole purpose of Android. Google uses Android to feed users directly into all of its content and services (and ads), but the Kindle Fire sends users to Amazon's own content ecosystem with its heavily forked version of Android. The OS has been modified so dramatically that it's unrecognizable compared to its brethren. Amazon is building its own ecosystem. It just happens to be built on an Android foundation that it got for free (thanks, Google!). The Kindle Fire's rise is not music to Big G's multicolored ears. Amazon continues to kick up the game against streaming rival Netflix (Nasdaq: NFLX), growing its Prime Instant Video collection to more than 17,000 titles. This still pales in comparison to Netflix's library, but Amazon bundles it with Prime's compelling value proposition. I've canceled my own Netflix subscription in favor of Amazon since I'm already a Prime member. I'll go back to Netflix soon, though, once those new exclusive Arrested Development episodes hit. There seems to be a recurring theme among Amazon bears: the lofty price-to-earnings ratio. If you take a step back and Foolishly look at the bigger picture, that metric has risen only in the past couple of years -- the same time frame that Amazon has been reinvesting heavily in its business. Note that this chart does not include last night's results. Sure, that's held back the bottom line (sending the P/E skyward), but top-line growth has been markedly accelerating over the same time as a result. If you include other valuation metrics like price-to-sales and price-to-tangible book value, Amazon's valuation hasn't changed much. Relying entirely on one metric for anything paints an incomplete picture. This was a strong report, sending shares back toward all-time highs. Content sales are climbing, Amazon's Web services division is booming, the Kindle Fire is cornering the Android tablet market, and gross margin ticked higher. Amazon is one of 3 Stocks That Will Help You Retire Rich, and the other two names are available for free in this special report. Everyone wants to retire rich, so you might as well pick up a copy today. It's totally free.